In the late 1950s, architect Edouard Albert erected a tall apartment building near Place d'Italie in the 13th arrondissement that was quickly dubbed "the first skyscraper in Paris." Read about this remarkable structure in this month's Paris Insights. We've discovered Tempero, another fine restaurant that seems to have been overlooked by Anglophone restaurant reviewers. 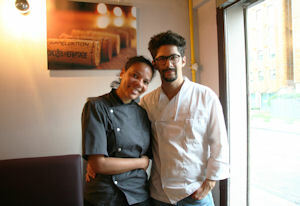 Operated by husband and wife team Olivier and Alessandra Montagne, Tempero is located near the Bibliothèque Nationale de France in the 13th arrondissement. Read our review in this month's Le Bon Goût. Artist Jacques Lagrange is probably best remembered for his set designs for filmmaker Jacques Tati's Les Vacances de Monsieur Hulot (1953) and Playtime (1967). 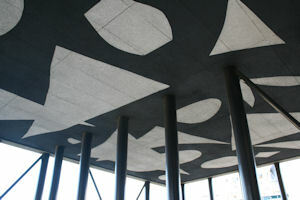 He also realized a monumental work—a painting on the ceiling of the terrace of the Croulebarbe Tower. Read our report in this month's Paris, Past and Present.